Daisy Lowe, Stylish On The Streets Of London! We spotted Gwen Stefani's step-daughter, British supermodel Daisy Lowe walking her dog in northern London on Friday. Daisy was showing off some pretty great winter wear in a gorgeous mix of color, plaid, knits and sheers. She was accompanied by a very cute male friend, and looked to be in good spirits despite her recent break-up with her TV-actor boyfriend, Matt Smith. What a refreshing sight it is to see a super model who doesn't mope! Eva & Ryan Are Going Steady! We spotted lovebirds Eva Mendes and Ryan Gosling enjoying day number two of their romantic Paris get-away yesterday. They were taking a stroll through the Pere Lachaise Cemetery, and although their location could undoubtedly have a lot been cozier than a paparazzi ridden cemetery, they didn't seem to let it bother them all too much. Willow Smith Covers Her Brother's And Justin Bieber's Cover! So about a week ago Justin Bieber and Willow Smith's older brother Jaden Smith did a pretty great cover of Frank Ocean's song Thinking about you. Jaden's little sister and pop star on the rise, Willow Smith was apparently so inspired by the cover that she decided to make her own tribute of their cover! How cute isn't that? The result turned out pretty good we think! You're Never Too Old For Disneyland! We spotted Reese Witherspoon, her hubby Jim Toth and her children Ava and Deacon spend some quality time together at Disneyland in Anaheim, California, yesterday. They were also accompanied by an older brown-haired couple, whom we are guessing were Jim's parents! We can't imagine that Reese's mother and father in-law would do anything but love her, and these pictures pretty much confirm our theory! There's so much love in that family! 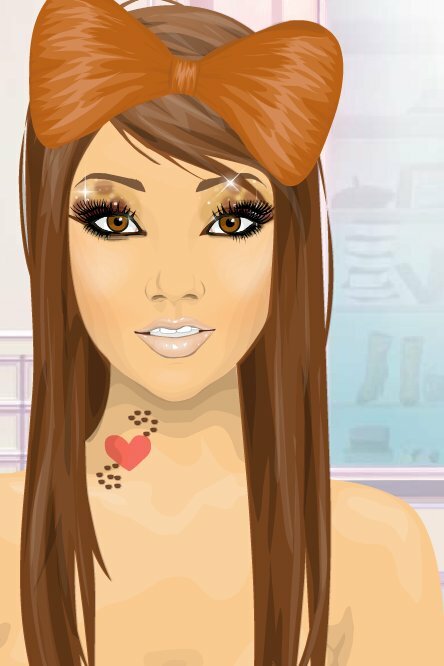 The current fashion trend on Stardoll is no doubt, the chic leopard print. In almost every store is Starplaza you can find leopard print clothing. Leopard print isn't only big with clothes! Bruce Willis isn't the only Hollywood star currently making rounds in Paris, just yesterday we spotted cutie pie Ryan Gosling touch down at the Charles de Gaulle Airport! Ryan traveled alone, and we're pretty sure the only reason for the trip is pleasure. In the evening he was spotted cuddling it up with his rumored girlfriend Eva Mendes at the Paris set of her new movie "Holy Motors", and later that night on-lookers saw the two of them enjoying a romantic dinner out on town. Sounds absolutely and utterly jealousy-inducing! A First Look At Emma Watson In "A Week With Marilyn"
It's her first big movie role after spending a decade as "Hermoine Granger" in the Harry Potter saga, and we think she's handling it beautifully! As you all know Emma Watson is playing the role of a wardrobe assistant named Lucy in the new bio-pic "A Week With Marilyn" and the first clip of her in it has just been released! Be sure to check it out below! Bruce Willis Takes His Daughters Shopping! We have come to the realization that Bruce Willis might just be one of the greatest celebrity dads around. Not only did he treat his daughters Rumer and Tallulah Belle to a Paris get-away over Thanksgiving, he also personally escorted them on a shopping-spree around Paris' most exclusive boutiques! Dads everywhere, take notes - this is how your daughters like to be treated! Tortoiseshell, a very popular and long-standing item, has been used for many things in the past. It's been used in numerous hair accessories, to back hairbrushes, in sunglasses, tea sets, jewelry boxes and most importantly, jewelry. Primarily it's a brown, black and often an orange pattern, nowadays made from plastic or plastic-like materials. So, you're probably wondering if it's tortoiseshell then why is it made of plastic? The design tortoiseshell came from when people would use the shell of an actual hawksbill tortoise. When the population of this specific tortoise caused for alarm, people backed off and began using plastic to achieve the desired look of the actual tortoise's shell. Style Tip: Ladies Who Love Leather! A leather jacket will never go out of style! And the best thing is that you can wear it all year! In the summer pair your leather jacket with a sundress and in the winter put it over a cozy sweater. A black leather jacket is classic, but we love Katherine Heigl's olive green one! Click on the pics to see celebs love leather.